The waitress at Ernie Risser’s family restaurant in Womelsdorf, PA, watches me looking dubiously at the gravy she just plunked down with the corn pie I ordered. Assuming we’re in cahoots, she leans in, whispers, “I like to eat corn pie with hot milk, too!” and smiles conspiratorily. Whisking away the gravy boat she soon returns with a little pitcher of milk. Strange upon strange, think I…but, it turns out, not awful. Still, I left plotting something better & more akin to my Midwest upbringing: homemade creamed corn with bacon and onion in a flaky pie crust. The result? This recipe. To make it, cut fresh sweet corn from the cob, simmer it in a peppered white sauce with smoked bacon, onion and red pepper, put it in the pie crust and while it bakes, go find greens to make a nice salad to serve on the side. Baby arugula or mache are nice. For a broader meal? 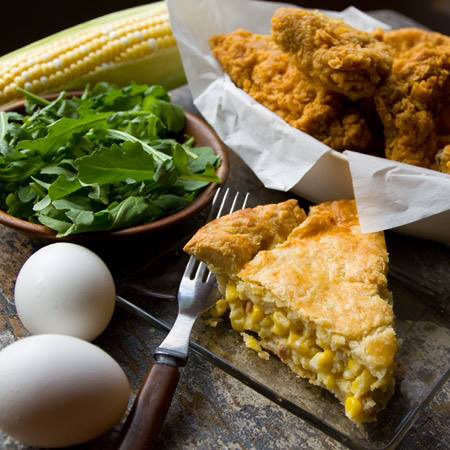 Corn pie pairs wonderfully with fried chicken and some vinegary pickles. New Midwest spin on old Pennsylvania corn pie! Sweetcorn cut from the cob, simmered in peppered white sauce with bacon and onion, and baked in a flaky pie crust. Make bacon: Brown bacon in frying pan until fat has rendered and bacon is well cooked. Remove bacon to a separate bowl using a slotted spoon, leaving bacon fat in skillet. Saute onion in bacon fat for two minutes, stirring often. Add 1/4 cup water and cover, simmering until onion is very soft but not brown. Stir corn and red pepper into onion. Add 1/2 cup water. Cover. Simmer for 5 to 10 minutes until corn is hot through and loses “raw” flavor. Season with 1 tsp salt and 1/2 tsp freshly-ground pepper. Remove to a bowl. Preheat oven to 350 degrees. 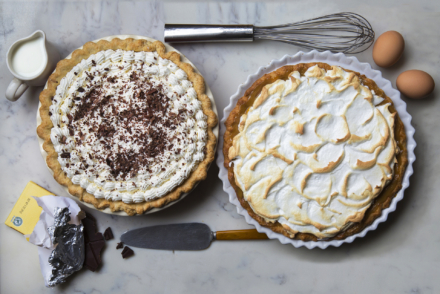 Roll out one of the pie pastry disks and fit into the bottom of a 9-inch pie dish. 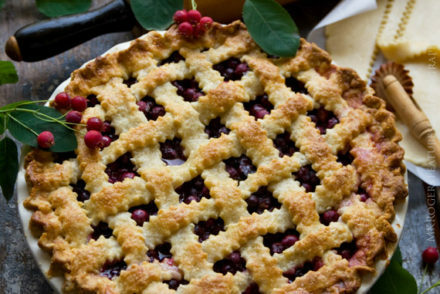 Fill pie with corn filling, mounding in the center. Roll out second pie pastry disk and top pie. Decoratively crimp edge. 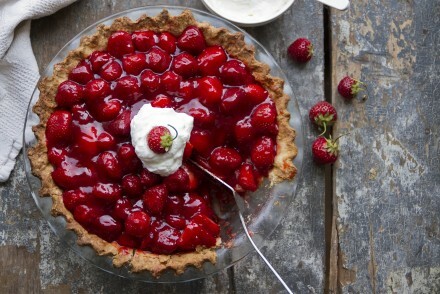 Brush top of pie with egg wash. Cut slits in top of pie to vent steam.